Substitute Jordan Bowery netted an injury-time equaliser to earn leaders Chesterfield a point against Bradford. Danny Whitaker drilled the hosts ahead after the ball broke off Jack Lester. But their lead was shortlived as Bradford's top scorer David Syers was left unmarked and headed in Gareth Evans' left-wing cross at the far post. James Hanson's header from another Evans cross gave the visitors the lead but Chesterfield stole a dramatic point when Bowery slotted home. "We definitely deserved to get something out of the game, but we left it very late. "If we had kept hold of the lead a little bit longer we could have gone on to win the game comfortably. "But they got the equaliser, it gave them a spring in their step and they got more involved in the game." "I treat myself to a Chinese takeaway when I get a win so I was looking forward to that. I'm really disappointed for the players because the way that they worked for each other deserved an away victory. "We scored two really good goals, so we're disappointed of course but we'll take a lot of positives out of it. "The character was very good from the players. They are always going to get chances here with the players that they've got, but I thought we looked very dangerous on the break as well and it didn't surprise me when James Hanson got the second goal." 90:00+3:54 The final whistle goes and the game is over. 90:00+2:31 Assist on the goal came from Gregor Robertson. 90:00+2:31 GOAL - Jordan Bowery:Chesterfield 2 - 2 Bradford Jordan Bowery gets on the score sheet with a goal from close in low into the middle of the goal. Chesterfield 2-2 Bradford. 90:00+0:24 Craig Davies takes a short corner. 90:00+0:18 Craig Davies produces a cross, clearance by Luke Oliver. 89:31 Drew Talbot concedes a free kick for a foul on Shane Duff. Jon McLaughlin restarts play with the free kick. 89:01 The ball is swung over by Drew Talbot, Jon McLaughlin makes a save. 88:53 Javan Vidal crosses the ball, clearance by Richard Eckersley. 88:18 Richard Eckersley is adjudged to have handled the ball. Tommy Lee restarts play with the free kick. 87:39 Danny Whitaker concedes a free kick for a foul on Tom Adeyemi. Gareth Evans restarts play with the free kick. 87:27 Craig Davies delivers the ball, Luke Oliver makes a clearance. 86:37 Booking Deane Smalley shown a yellow card. 86:09 The ball is crossed by Drew Talbot, save by Jon McLaughlin. 84:36 Substitution Jordan Bowery joins the action as a substitute, replacing Derek Niven. 83:21 The ball is delivered by Drew Talbot, Deane Smalley has a header from close range and clears the crossbar. 81:48 The ball is delivered by Gregor Robertson. 81:36 The ball is swung over by Drew Talbot, Luke Oliver makes a clearance. 80:19 Dave Syers challenges Derek Niven unfairly and gives away a free kick. Tommy Lee takes the free kick. 79:49 A cross is delivered by Deane Smalley, Shane Duff makes a clearance. 78:41 Substitution Jonathan Worthington goes off and Michael Flynn comes on. 78:16 Mark Allott takes a shot. Comfortable save by Jon McLaughlin. 78:02 Gregor Robertson delivers the ball, Shane Duff makes a clearance. 76:22 Omar Daley sends in a cross. 75:12 The ball is swung over by Craig Davies, save made by Jon McLaughlin. 74:01 Gareth Evans gives away a free kick for an unfair challenge on Ian Breckin. Javan Vidal takes the free kick. 73:31 Shot by Craig Davies from a long way out goes over the target. 72:49 Centre by James Hanson. 70:48 The ball is swung over by Gregor Robertson, Gareth Evans gets a block in. 69:44 The ball is sent over by Craig Davies. 67:56 Inswinging corner taken from the left by-line by Danny Whitaker. 67:21 Drew Talbot decides to take a short corner, Centre by Javan Vidal, clearance made by Shane Duff. 67:12 Gregor Robertson crosses the ball, Luke O'Brien manages to make a clearance. 66:04 Shot from just outside the penalty area by Craig Davies misses to the left of the target. 64:49 Centre by Luke O'Brien. 64:07 Outswinging corner taken by Danny Whitaker, Luke O'Brien makes a clearance. 63:55 A cross is delivered by Craig Davies, Luke O'Brien manages to make a clearance. 63:18 The ball is sent over by Javan Vidal, clearance made by Shane Duff. 62:06 Gregor Robertson crosses the ball, Jon McLaughlin makes a comfortable save. 61:47 Dave Syers concedes a free kick for a foul on Javan Vidal. Derek Niven takes the indirect free kick. 61:10 Danny Whitaker crosses the ball. 60:34 Inswinging corner taken from the left by-line by Danny Whitaker, clearance made by Shane Duff. 60:09 Omar Daley sends in a cross, Tommy Lee manages to make a clearance. 59:17 Dwayne Mattis challenges Tom Adeyemi unfairly and gives away a free kick. Free kick taken by Luke O'Brien. 58:39 Effort on goal by Craig Davies from just inside the area clears the crossbar. 57:57 Effort from outside the box by Craig Davies goes wide right of the target. 56:28 The ball is sent over by Gregor Robertson, clearance by Shane Duff. 55:04 Outswinging corner taken right-footed by Danny Whitaker, James Hanson makes a clearance. 54:58 Centre by Drew Talbot, Luke O'Brien manages to make a clearance. 54:27 The assistant referee signals for offside against James Hanson. Tommy Lee takes the free kick. Correction - 52:28 GOAL - James Hanson:Chesterfield 1 - 2 Bradford James Hanson scores a headed goal from inside the area. 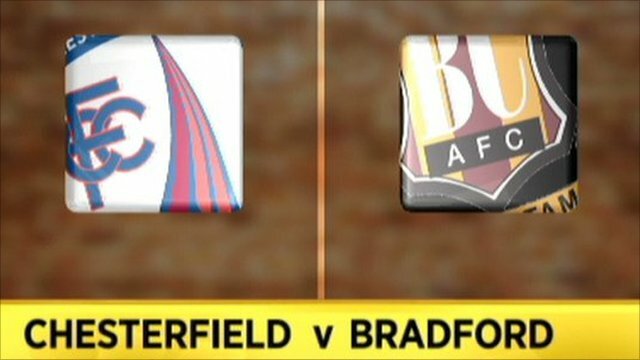 Chesterfield 1-2 Bradford. 52:28 Assist by Gareth Evans. 52:28 GOAL - James Hanson:Chesterfield 1 - 2 Bradford James Hanson scores a headed goal from inside the area. Chesterfield 1-2 Bradford. 51:20 Substitution Deane Smalley joins the action as a substitute, replacing Jack Lester. 50:46 Omar Daley produces a cross, clearance made by Ian Breckin. 50:32 The ball is crossed by Craig Davies, clearance made by Luke O'Brien. 49:46 The ball is delivered by Luke O'Brien, clearance made by Derek Niven. 47:50 Jonathan Worthington concedes a free kick for a foul on Jack Lester. Javan Vidal restarts play with the free kick. 46:25 Tom Adeyemi fouled by Gregor Robertson, the ref awards a free kick. Jon McLaughlin restarts play with the free kick. 45:02 Substitution Simon Ford leaves the field to be replaced by Javan Vidal. 45:00+1:49 Gregor Robertson delivers the ball, Shane Duff makes a clearance. 45:00+0:15 Inswinging corner taken right-footed by Gareth Evans, clearance by Ian Breckin. Correction - 43:57 Free kick awarded for a foul by Ian Breckin on James Hanson. Gareth Evans produces a strike on goal direct from the free kick, save made by Tommy Lee. 43:57 Ian Breckin gives away a free kick for an unfair challenge on James Hanson. Gareth Evans shoots direct from the free kick, save by Tommy Lee. 41:05 The ball is crossed by Omar Daley, save made by Tommy Lee. 38:55 Corner taken by Danny Whitaker from the right by-line, Shot from close range by Simon Ford clears the bar. 38:43 Centre by Gregor Robertson, clearance by Luke O'Brien. 37:42 A cross is delivered by Luke O'Brien, Gregor Robertson manages to make a clearance. 37:12 The ball is delivered by Tom Adeyemi, clearance made by Simon Ford. 36:27 Gareth Evans fouled by Gregor Robertson, the ref awards a free kick. Jon McLaughlin restarts play with the free kick. 35:23 Substitution Omar Daley comes on in place of Leon Osborne. 35:11 Gregor Robertson crosses the ball, Gareth Evans makes a clearance. 35:01 Drew Talbot produces a cross. 33:26 Gareth Evans takes a corner. 32:57 Craig Davies takes a shot. Save by Jon McLaughlin. 30:18 Luke Oliver challenges Craig Davies unfairly and gives away a free kick. Danny Whitaker takes the indirect free kick. 28:45 The ball is swung over by Mark Allott. 28:15 Inswinging corner taken by Danny Whitaker from the left by-line, Jon McLaughlin manages to make a clearance. 25:03 Leon Osborne crosses the ball. 24:14 The ball is swung over by Luke O'Brien. 23:20 Corner taken left-footed by Luke O'Brien from the right by-line, clearance made by Simon Ford. 23:11 Luke O'Brien delivers the ball, Gregor Robertson manages to make a clearance. 21:37 Free kick awarded for an unfair challenge on Mark Allott by Dave Syers. Free kick taken by Tommy Lee. 21:21 Centre by Gareth Evans, clearance made by Ian Breckin. 20:11 Inswinging corner taken by Gareth Evans, Simon Ford makes a clearance. 19:34 Shane Duff concedes a free kick for a foul on Jack Lester. Danny Whitaker restarts play with the free kick. 18:58 Danny Whitaker takes a shot. Jon McLaughlin makes a comfortable save. 18:07 Gareth Evans takes a shot. Save by Tommy Lee. 16:20 Leon Osborne concedes a free kick for a foul on Ian Breckin. Free kick taken by Tommy Lee. 11:52 Gareth Evans provided the assist for the goal. 11:52 GOAL - Dave Syers:Chesterfield 1 - 1 Bradford Dave Syers fires in a goal from inside the penalty area to the bottom right corner of the goal. Chesterfield 1-1 Bradford. 11:23 Inswinging corner taken by Gareth Evans, Ian Breckin manages to make a clearance. 10:09 Assist by Jack Lester. 10:09 GOAL - Danny Whitaker:Chesterfield 1 - 0 Bradford Goal scored by Danny Whitaker from deep inside the penalty box low into the middle of the goal. Chesterfield 1-0 Bradford. 8:42 Inswinging corner taken from the left by-line by Gareth Evans, Dave Syers takes a shot. 8:32 The ball is swung over by Luke O'Brien, blocked by Drew Talbot. 6:31 A cross is delivered by Gregor Robertson, Shane Duff manages to make a clearance. Correction - 6:02 A cross is delivered by Drew Talbot, Shane Duff gets a block in. Clearance made by Shane Duff. 6:02 The ball is swung over by Drew Talbot, blocked by Shane Duff. 3:23 The ball is delivered by Drew Talbot, clearance by Jonathan Worthington. 1:25 The ball is sent over by Craig Davies, Shane Duff gets a block in. 0:52 Centre by Drew Talbot, Tom Adeyemi makes a clearance.